How Depression Effects Elderly People? Clinical depression is something that many elderly people suffer from commonly. In fact, there are over 6 million Americans alone over the age of 65 who are clinically depressed. And because of their old age, a very small number of them seek treatment for this depression. One reason that many elderly people do not seek treatment is because they do not have the depression diagnosed in the first place. This is because the symptoms of depression in elderly people are not the same as the symptoms that show up in people who are younger. Also, many elderly people suffer from a variety of other illnesses, and sometimes the depression is chalked up to these other illnesses and conditions. So, what is the different between the depression symptoms that elderly people experience compared to the symptoms most commonly seen in younger people? The answer is that it is not the symptoms that are much difference; it is the environment that they appear in. Many elderly people do not have the family support system like younger people do. Many of them move away from their families and some of them live in retirement homes by themselves. Also, many elderly people have had their spouses and friends pass away as well, which leaves many of the alone, and therefore, no one there to recognize the symptoms of depression. Also, many doctors do not notice symptoms of depression in older people because they attribute those symptoms to old age right away. 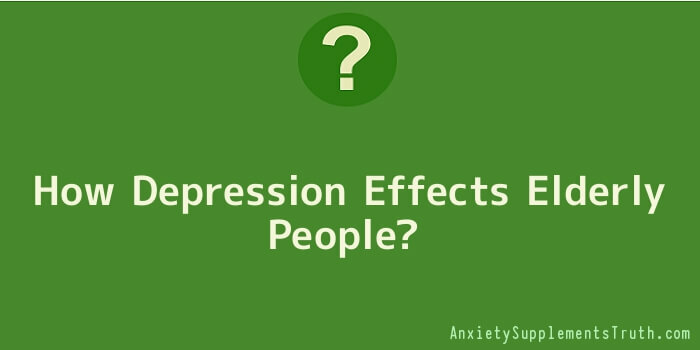 When this occurs, there are no treatments given to help with the depression, and in many cases, depression that could have been easily taken care of with treatment gets worse and worse as the symptoms remain unnoticed and the depression continues to go untreated. The elderly people that are more likely to become depressed include females, people who are single, either because they are unmarried, divorced or widowed, or people who are living alone, far away from friends and family. Also, people who have gone through stressful health-related events such as strokes, diabetes, cancer or some type of chronic pain are also more likely to become depresses. There are also many medications and combinations of medications that can lead to depression, and as we know, elderly people generally take a lot more medications than younger people do. People who have a family history of depression are also more likely to become depressed as senior citizens. Often a fear of death that comes with old age is another reason people tend to fall into a state of clinical depression. Deaths occurring around them can also lead to depression, especially when close family members and friends die. It has been seen that people who outlive their children have a great risk of becoming depressed. The treatment for depression in the elderly is very similar to the treatments for younger people, but of course, the main problem comes with the diagnosis. Once it is diagnosed, then it can be treated just like any other case of depression – usually with a combination of medication and psychotherapy.